Good things do come in small packages. This is especially true in the case of Yunnan Bai Yao, one of the most well known patent medicines among Traditional Chinese Medicine professionals and martial artists. Yunnan Bai Yao is a first aid kit in a bottle - a tiny bottle. It fits in your pocket or saddlebag and is a must have for every stable and home first aid kit. It may be small, but its effects are great. Here in the west we first became acquainted with this powdered formula during the Vietnam War. This little bottle was the primary first aid kit for the North Vietnamese soldiers for knife stabbings, gun shot wounds and fractures. Modern research has shown its use has markedly shortened both the bleeding and clotting times in rats, rabbits and humans. Yunnan Bai Yao is so versatile that it is used orally and topically. 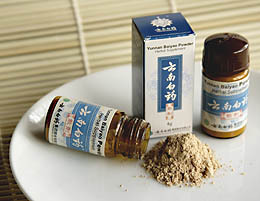 Topically, Yunnan Bai Yao powder significantly shortens coagulation time if applied directly to a wound. It can stop bleeding without leaving scars. When applied as a paste mixed with water, wine or vinegar it is ideal for sprains, strains, blunt force traumas or bruises. It shortens recovery time, reduces pain and swelling. Mixed with Vitamin E oil and applied to new scars, it is very useful in minimizing scaring and in proud flesh formation. Orally, Yunnan Bai Yao is used for injuries or traumas to stop bleeding, promote the blood circulation, reduce inflammation and dissolve blood stagnation (bruises). It is easily added to horses’ grain or sweet feed. One or two 4-gram bottles are usually adequate for a 1000-pound horse. Yunnan Bai Yao’s ingredients are a closely guarded secret, but the main ingredient is known to be San qi (Radix notoginseng), regionally known as "Gold No Trade" because it was considered to be more valuable than gold to stop bleeding. It is considered one of the most important Chinese herbs used for trauma. According to Chinese wisdom, “Luck is when opportunity meets preparedness.” Yunnan Bai Yao is preparedness in a bottle for the inevitable kicks, bites, sprains, strains and falls that are a part of horse ownership. Yunnan Bai Yao is not recommended for internal use during pregnancy or with antiplatelet or anticoagulant medications, but may be used topically during these conditions.